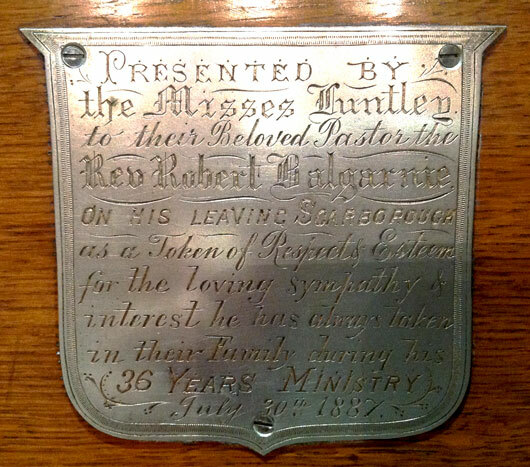 Presented by Misses Huntley to their Beloved Pastor the Rev Robert Balgarnie on his leaving Scarborough as a Token of Respect & Esteem for the loving sympathy & interest he has always taken in their Family during his 36 years ministry. July 30th 1887. 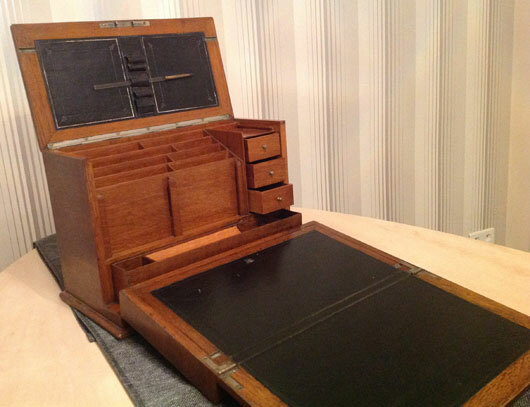 This information has come to light following contact from Giz and Marijke van de Kleut, owners of Balgarnie's writing box. Giz and Marijke are a Dutch couple who are now living in Guerande, in the Loire Atlantique area of Brittany, France. Guerande is a castle walled town overlooking salt marshes, an apt place for an artefact so closely connected to Sir Titus Salt. 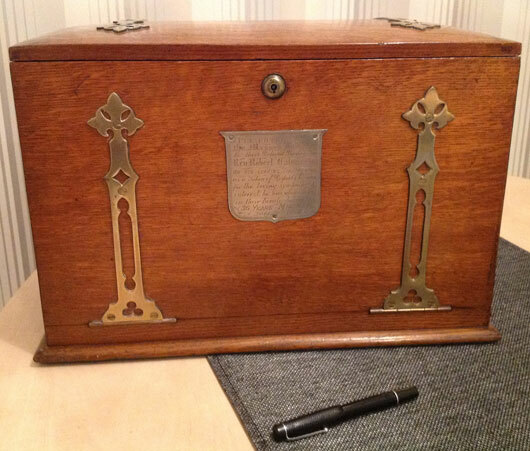 January, 2014: Giz van de Kleut writes: I think my parents bought it (Balgarnie's writing box) in the 60's from an antique shop in Stalybridge which was then in Cheshire. Years later when they'd moved back to Holland, I inherited the box and then 12 years ago my wife and I moved from Surrey to France taking the box with us. These photographs have been taken by Giz, and are displayed here with his kind permission. Many thanks to Giz and Marijke for getting in touch with the website to share this information. Front side, showing the inscribed plaque and hinges. The Reverend Robert Balgarnie, the Congregational minister of South Cliff Church, Scarborough, became a personal friend of Sir Titus Salt and his family, who took holidays in Scarborough and attended church there. In the months following Sir Titus Salt's death in December 1876, Robert Balgarnie wrote a biography of Titus Salt. This work has been written during the summer season, and amid the pressing duties that a large seas-side congragation entails. We are fully aware of its many imperfections; but, such as it is, we send it forth. It has been, throughout, a labour of love, which we have gladly performed, in memory of one whose long friendship has been to us, both an honour and a privilege. Though the lack of material, especially in connection with his earlier years, has rendered our task more difficult than we anticipated, yet we have done our best. If the record of such a life shall furnish the reader with an example worthy of imitation, - if it shall stimulate him to lofty purpose, - above all, if it shall induce him to regulate his course by Christian principles, and "to seek those things which are above," - the highest desires of the writer will be attained. "This memoir of him with who her own life was united forty-seven years, is respectfully dedicated, as a humble offering of affection, both to the living and the dead." Original copies of Sir Titus Salt, Baronet. His Life and its Lessons, by Rev. R. Balgarnie, Minister of the South Cliff Church, Scarborough, are scarce. The book is available on the Internet via openlibrary.org, where you can read it in its entirity online and for free. You can also purchase a transcribed version of the biography with commentary and additions by Barlo & Shaw.